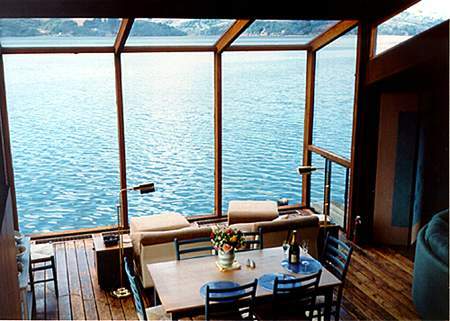 Located in Marin County, The Poets’ Loft is an exquisite vacation rental on Tomales Bay in Marshall, California. It is spacious and comfortable – half bath on the 1st floor, living room and kitchen on the 2nd floor and a master, guest bedroom and one bathroom on the 3rd floor. To accommodate to your at-home needs, we have a fully equipped kitchen and dining area with a beautiful and breathtaking view of Tomales Bay. Or take your dining outside on our private patio complete with hot tub. After, cozy up on our comfortable couches and warm your toes in front of the wood-burning stove. Launch your kayak or boat, go fishing, or watch a sunset from The Poet’s Loft’s private dock. You will be taken away by the sweeping views of Tomales Bay and Point Reyes Peninsula. The feel is casual and comforting, private and quietly indulgent.